Sometimes as a Monster Man, you just have to bite the bullet for the greater good. Fall is here and the shelves are bursting with dozens of different seasonal pumpkin beers to choose from. Jack and I ponied up to the bar and did some taste tests to let you know what to run out and buy and what to avoid. Let me tell you, it was a way better experience than our monster wine taste test. Find out who rules #Horrortober! Naturally, this is my favorite month, the time when I have all the irons in the fire and surround myself with all things horrific. I’m watching at least 1 horror movie a day and posting them on Twitter with the hashtag #Horrortober. I’m also posting some quick reviews on what I’m watching and reading over at The Monster Men blog. Two of my books, SWAMP MONSTER MASSACRE and THE MONTAUK MONSTER, were just named in Horror Novel Reviews 100 Scariest Books of All Time. If you’re a horror reader, check out the list and see how many you’ve got under your belt. Speaking of Swampy, a review of the audiobook was just posted at Reading Between the Wines (my favorite way to read!). I think they dug it. I mean, who doesn’t love a good, murderous skunk ape tale? There’s a new review of my terror-filled western, HELL HOLE, over at the blog for Lindsey R. Loucks. We also did a fun, unique Q&A. Interviewers take note! She was truly original. I have a special I’ll be running for Hell Hole next week, so stay tuned. Last but far from least, I was also happy to be on the return episode of POD OF HORROR, where we talked about The Montauk Monster and some of my upcoming projects. An awesome podcast that you should be checking out. Plus, they love Jonathan Janz, so they’re my kind of peeps. Now, if you’ve made it this far, you should be properly rewarded. For those living in the US, send me an email at huntershea1@gmail.com with the subject : 100 Scary Books. Let me know the scariest book you ever read. I’ll pick 2 people at random to win a signed copy of The Montauk Monster. Oh, it’s that time of year again, my dead little friends (you know, you shouldn’t play with dead things). I can finally tear into all of the books and movies and podcasts and TV shows I’ve been saving all year for Horrortober. Now, you all know that I watch at least 1 horror movie a day in October and rate them on Twitter using my Mummy inspired system of 9 tana leaves. What I look forward to the most are the books and stories I’ve been collecting. This year, I plan to take on a heavy load, but it will be worth it. If you’re looking for a spooky to read, whether it be fiction or true tales of the unexplained, I hope you find something on this list to whet your bloody appetite! Get ready, this is gonna be a big one (insert crude remark here). There are 3 novellas I can’t wait to read from my fellow Samhain Horror authors. You can download any one of them yourself for just a few sheckles (and I won’t stop you from picking up my true haunting tale, THE WAITING). Beneath the city of Boston, evil is gathering. Journalist Daniel Finley is determined to save the impoverished of the world. But the abandoned part of humanity has a dark side too. While living under a bridge with the homeless for six months, Daniel witnessed something terrifying. Something that nearly cost him his sanity. Now, two years later, he’s published a book that exposes a deadly underground cult and its charismatic leader. And Daniel fears the vagrants are after him because of it. At the same time, his father is being terrorized by vicious mobsters. As he desperately tries to help his father, Daniel gets caught up in the middle of a war between the Irish-American mafia and a deranged cult of homeless people who are preparing to shed blood on the streets of Boston. Eighty-two-year-old Beth Baker can hear the cop in apartment 7C beating his wife. Again. She’s also having dreams—or are they visitations—of her dead daughter, Alice, who was killed fifty years ago by an abusive husband. The message is clear—Beth has to take care of the cop. But he’s a decorated detective and over two hundred and fifty pounds of muscle, so what’s a little old lady like her going to do? When things turn ugly and the cop threatens Beth’s own life, she realizes she needs to resort to extreme measures. Blood must be shed. The Bruton Inn, located outside of the small Maine city of Hollis Oaks, is home to something special. An icy presence has made its way from a dark past to the present day. Cold spots, shadows, and whispers permeate the halls, and guests are beginning to change.For two front desk employees, Rhiannon and Jeff, the dark rumors are about to come to light. They call upon Lee Buhl, the urban shaman, and his connection with the spirit world to dig up the truth.Will they be able to stand against this malevolent force? Or will they come face to face with something beyond even your most frightful dreams. Welcome to the Bruton Inn. The Ice Queen has arrived. This book takes you to Yonkers , New York .This is based on a true story of a real life haunting. Donna and her family endured several years of horrifying incidents that scarred them for life . No matter how many years have passed that house still remains as does the haunting . Although Donna and her family have been out of the home over thirty years … This is one story that needed to be told . The Cranmers seemed fated to own the house at 3406 Brownsville Road. As a young boy, Bob had been drawn to the property, and, just when the family decided to move back to Brentwood, it went up for sale. Without a second thought, they purchased the house that Bob had always dreamed of owning.But soon, the family began experiencing strange phenomena—objects moving on their own, ghostly footsteps, unsettling moaning sounds—that gradually increased in violence, escalating to physical assaults and, most disturbingly, bleeding walls. Bob, Lesa, and their four children were under attack from a malicious demon that was conjuring up terrifying manifestations to destroy their tight-knit household. They had two choices: leave or draw on their unwavering faith to exorcise the malicious fiend who haunted their home. The author of the controversial bestseller Brain Trust brings his scientific expertise to the chilling true story of unexplained phenomena on Utah’s Skinwalker Ranch — and challenges us with a new vision of reality.For more than fifty years, the bizarre events at a remote Utah ranch have ranged from the perplexing to the wholly terrifying. Vanishing and mutilated cattle. Unidentified Flying Objects. The appearance of huge, otherworldly creatures. Invisible objects emitting magnetic fields with the power to spark a cattle stampede. Flying orbs of light with dazzling maneuverability and lethal consequences. For one family, life on the Skinwalker Ranch had become a life under siege by an unknown enemy or enemies. Nothing else could explain the horrors that surrounded them — perhaps science could. There are so many more I’d like to add, but there just so much time. Somwhere in there, I actually have to finish the next monster novel I’ve been working on, too! I plan to dive into my Horrortober reading pile today to get myself in the proper mood. What reads are you looking forward to diving into this Horrortober? Every person that replies with a book they want to read will be entered to win a sign copy of my book, THE MONTAUK MONSTER, delivered just in time for Halloween! If I get a lot of replies and recommendations, I just may select 2 or 3 winners, so bring it on. OK, this Halloween nearly did me in! And that’s a good thing. I once again achieved my goal of watching a horror movie every day (my favorite new flicks – new to me – being Rites of Spring and Revenge of the Creature). I read all of the books on my Horrortober reading list. Kudos to Kealan Patrick Burke for making my stomach turn with Kin. Awesome stuff. On Halloween night, we had over 300 costumed kiddies come to the house. After canceling Halloween last year due to super storm Sandy, they had to make up for lost time. Yes, I and my twisted children dressed up to scare those kids who only wanted some candy. What was I? I have no clue. I was something no one else was likely to see that night. You be the judge. In the dark, with my hooded black jacket, it was effective enough to make trick or treaters pause. Heh heh heh. The 99 cent sale for my first short story collection, ASYLUM SCRAWLS, is over, but it didn’t go up much. You can download a copy now for just $1.99. I noticed that quite a few folks have already checked into the asylum. How about you? A little thorazine, three hots and a cot, get some rest. Congratulations to Lindsey Loucks who won a signed copy of SINISTER ENTITY. Thank you for playing along with my madness. We’ve made some updates to the Monster Men website, adding a podcast archive so you can catch all the episodes you’ve missed. I have some exciting announcements to make over the next few weeks, so stay tuned. Oh, and thank you all for making SWAMP MONSTER MASSACRE an audiobook bestseller. It’s an honor to be beside the likes of Tim Lebbon and Ron Malfi. I’m telling you, those skunk apes are gonna rule the world one day. The first time she went several years ago, she said it was just an old, empty building and she didn’t think it was scary at all. Pretty brave for an 11 year old. This year, they went back to Philly and once again walked the haunted halls. Ivy said the vibe this time around was very, very different. The atmosphere was heavy and it felt like they were being watched everywhere they went. She snapped pictures constantly. Two of them are interesting. 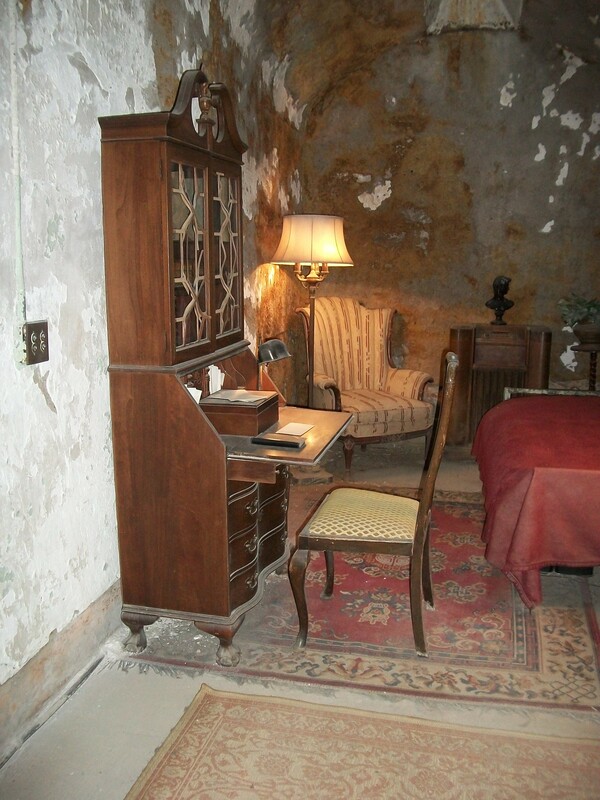 This first one shows Al Capone’s cell. If you look at the left arm of the chair, you can make out a face. Is it just the pattern of the paint on the wall? A case of Pareidolia, the mind’s way of putting a face to seemingly random shapes? Or is it the lingering image of an inmate long, long gone, at least from this world? I don’t pretend to know. It is fascinating to me how many views one can take on a simple, single image. Take a look a the armchair at the rear of the cell and decide for yourself. The second picture was taken down one of the empty wings of the prison. The area was roped off. Ivy was at the front of the line and snapped a couple of pictures. She saw nothing at the time but a long, lighted, empty hall. When we looked at the pictures later, we discovered a large, black mass a the bottom of the picture. It appears to be in the distance, as the light on the far wall shines past it. Again, I don’t know what this is other than highly interesting. No one was in that wing. No one was in front of her. Yet there is a black mass. Strange. I wish I could spin a spine tingling tale about poor Ivy coming face-to-face with the wraith of an executed prisoner, but I can’t. The rich, haunted history of the penitentiary and these and other photos from hundreds of visitors will have to suffice. Speaking of haunted places, Priority One Jets just posted a list of 7 Terrifying Haunted Attractions. 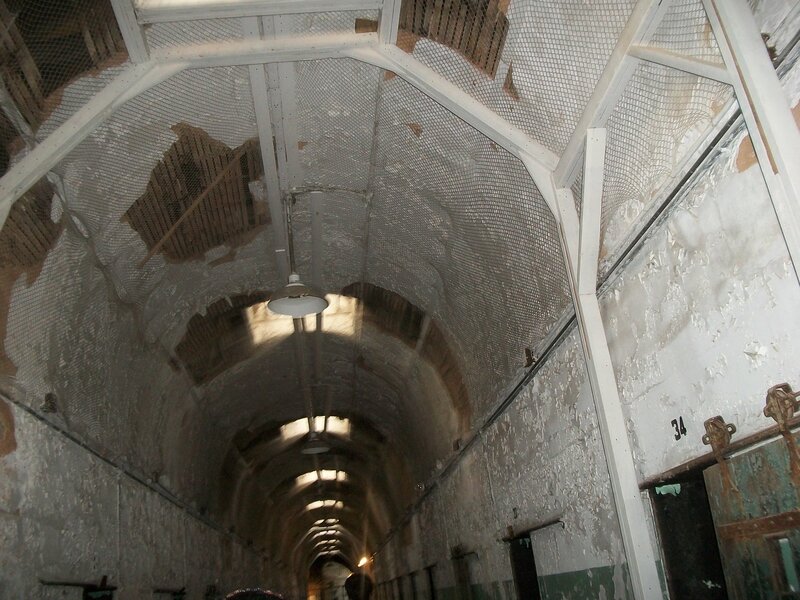 Naturally, Eastern State Penitentiary is on the list. If you’re looking to really get your scare on this Halloween, you need to pick your favorite from the list and just go. The catacombs in Paris is tops on my list. Honestly, if and when I do go to France, that and a few of Hemingway’s favorite writing/drinking spots may be the only places I check out. Who needs to see that tower thingy and those museums? My question is, what famous haunted spots have you been to? Were you one of the lucky few to see and/or hear something that can’t be explained? Come sit by the fire. There’s time for one more story…. Now that the calendar has turned to October and Halloween season is upon us, it’s time to really dive into horror, and I mean headfirst. There are only 31 days, so let’s not waste any of them. Naturally, there’ll be plenty of scary movies and shows on TV, but it’s also a great time to pick up a good book. Being good friends with a horror author has some great perks. Not only do I have a blast co-hosting the Monster Men horror podcast, but I also get exposed to a whole world of fantastic horror literature that I may not have found on my own. Reading is such a wonderful way to enjoy the genre. When you find a good book, you get sucked into a new world and your mind becomes your movie screen. You are much more connected with the characters and let’s face it, books can go to so many more places than any movies. It got me thinking about how important books have been in my journey as a horror fan. When I was a kid, the school library and the public library were treasure troves of monster books. So, before I was even old enough to watch Dracula or Frankenstein, I was devouring books about monsters, ghosts and urban legends like Bigfoot and the Loch Ness Monster. Here are a few books that helped fuel my imagination and molded me into the Monster Man I am today. First we have Movie Monsters and Monsters from the Movies by Thomas Aylesworth. These books were in my elementary school library and I made a beeline for them every chance I could get. The photos of Dracula, Frankenstein’s monster, the Wolf Man and all those other wonderful creatures grabbed my imagination and never let go. One of the reasons those books got such a prominent place on the bookshelves was that Aylesworth’s wife happened to be the art teacher at our school. Pretty cool, huh? Another book that I owned, and still have today, is Horror Movies: Tales of Terror in the Cinema (The Movie Treasury) by Alan G Frank. This book is amazing. Way before I saw most of the Universal Monster movies or the Hammer horror films, I had this book. It has chapters on vampires, werewolves, mummies and every other kind of fiend you can imagine. There are some terrifying photos, particularly of Christopher Lee, that had me leaving a light on when I went to bed. Then, as I got older, I had a great guidebook for movies to seek out. This book covers everything from Frankenstein Must Be Destroyed to Vampire Circus. Of course, as time went by, I graduated to more traditional books like Salem’s Lot and Pet Sematary, but it really all started with monster books like these. So this Halloween season, I urge to turn off the TV once in a while and curl up with a good, scary book. On the latest episode of Monster Men, Hunter and I suggest a whole pile of excellent horror novels. This includes terrific books by Tim Myer, Brian Moreland, Jonathan Janz, Jamie Evans and Frazer Lee. (And Hunter Shea, of course.) If you have not read these guys yet, you really ought to check them out. Not only will you be supporting some great people, but you’ll also be in for a hell of a read. Jack Campisi is the co-host of the Monster Men video podcast, along with Hunter Shea. 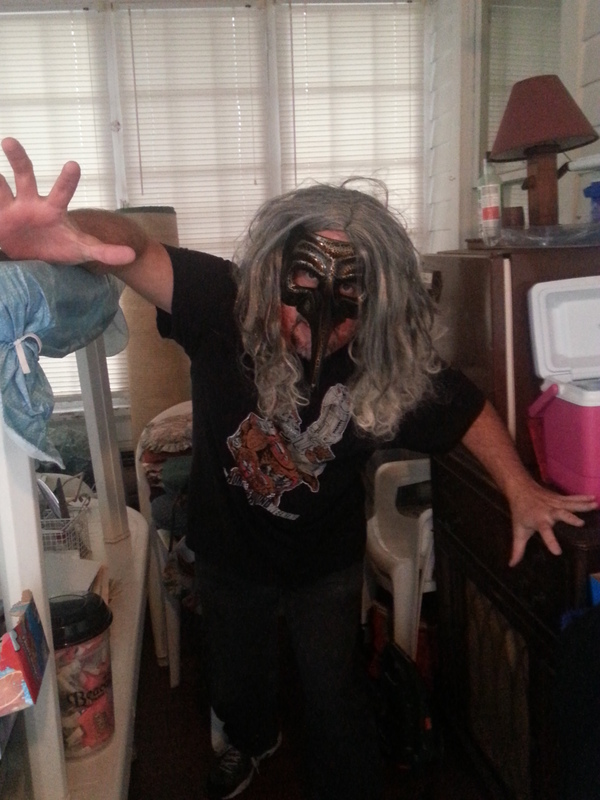 Follow him on Twitter at @backinjack and join the Monster Men on Facebook for more spooky fun. It’s a grand day here in the Monster Men dungeon. The Halloween season is in full swing and we’re feeding the Samhain beast with movies, books, TV shows and more. This year, we have a couple of surprises, eat some Halloween treats, talk with our mouths full and behave like the monsters we are. Check out the little contest we threw in to win copies of my books. We didn’t make it easy, but a true horror hound will get it. Good luck! I have a special treat for you today (I’ll save the tricks for Samhain eve). Today’s guest post by Adrian Rawlings talks about the do’s and don’ts of fleeing from a crazed killer, ala Michael Meyers or Jason Voorhees. This is prime stuff, not to be missed if you live near a camp or broken down house with a sketchy past or anywhere in the Bronx. Read on, then run to your TV and watch your favorite slasher flick! A horror movie really cuts to the core of our psyches when it hits close to home. Literally. Long before R. Kelly took the world by storm with “Trapped in the Closet” (some would call this a horror of a film, but I digress and disagree), Michael Myers was driving Laurie Strode into the same fate. You know how it goes. You’re enjoying a nice bubble bath, thinking about life, relaxing and minding your own business, when all of a sudden, the call is coming from inside the house. Your location has been compromised. There’s no rewinding the tape on that one. Now what do you do? ~ The worst place to hide is, as we all know, the closet. It’s the first place murderers are going to look, and there’s only one way out – the way he’s coming in, cleaver first. ~ Don’t hide in the shower. Not only can a bloodthirsty Psycho see right through the curtain or misty glass. Is that how you want to go? And how easy is that cleanup going to be? Prints destroyed, blood washed away. Don’t be so easy. ~ Come on, don’t hide under the bed. Monsters inherently live under there, so they’ll certainly look there first. Same goes for hiding under other pieces of large furniture. ~ Push that copy of Steven King’s IT and step into your rifle-and-canned-food-filled secret passageway. This may be an extreme, but every house has some secret hiding places. Here are 35 secret passages that can be built in to homes. ~ How flexible are you feeling? Can you hold yourself up near the ceiling using four points of contact? Serial killers too often wear masks or have parts of their faces missing, so peripheral vision is not their strong point. Try hiding in an unlikely kitchen cabinet, a bean bag chair, etc. Get creative in where you would hide to avoid becoming an easy target. Look for a piece of furniture you can fit into instead of under. ~ Run outside… with caution. It will most likely be night time. Are you wearing white? A negligee? A white negligee and it is raining? These things make your capture all the more likely. However, if you live near a police station or a town with an unsexy nightlife, you are going to be fine. Hopefully you don’t have to run through the woods, if you do your chances of surviving decreases tremendously. The serial killer trope will always be alive and well, no pun intended. That’s why they’re serial. The more they murder, the better they are at hide-and-seek. Deep in our fragile cores, we’re all pretty terrified of a home invasion that results in the ultimate, undignified, drooling-and-shitting-our pants-sacrifice. Hide-and-seek is a universally loved childhood game. Keep your head, don’t move or breathe, and you’ll live to see the sequel. Stay up on the chiller horror shows on Directtv to see how people are being found by their killers. Avoid following those same footprints if you find yourself in those unfortunate predicaments. Adrian Rawlings is a TV and horror blogger. Look to him for the scoop on hit movies and TV shows, horror, tech reviews, how-to’s, and more.